BENTON HARBOR, MI — There is an old adage that says history is determined by those who show up. The same might be said about winter angling: Those who show up are the ones who catch fish. I had a chance to ponder this notion recently. It was a toe-nipping, late-January day and I was thumbing a reel, trying to slow things down, attempting to land a 10-pound steelhead on the lower St. Joseph River. The big male slammed one of our crankbaits as the sun cleared the trees. The fish hit where Capt. Russ Clark, owner of Sea Hawk Fishing Charters, had promised us a fish. And, that fish was aggressively attempting to get back to Lake Michigan. “That’s a very nice fish,” Clark said, laughing in good humor when he netted it minutes later, knowing we would hold him to the promise. We’d just spent two hours running from hole to hole with spotty results. Clark nets another good fish. Photo: Howard Meyerson. for a month because of the ice and the weather,” Clark said. Other anglers were fishing upstream, near Berrien Springs, where fall-run steelhead had been stopped by the dam. The river is well-known for its steelhead. They move out of Lake Michigan to spawn in fall, then remain in the river all winter while new fish trickle in. Fishing can be hot until New Year’s, when the river freezes. 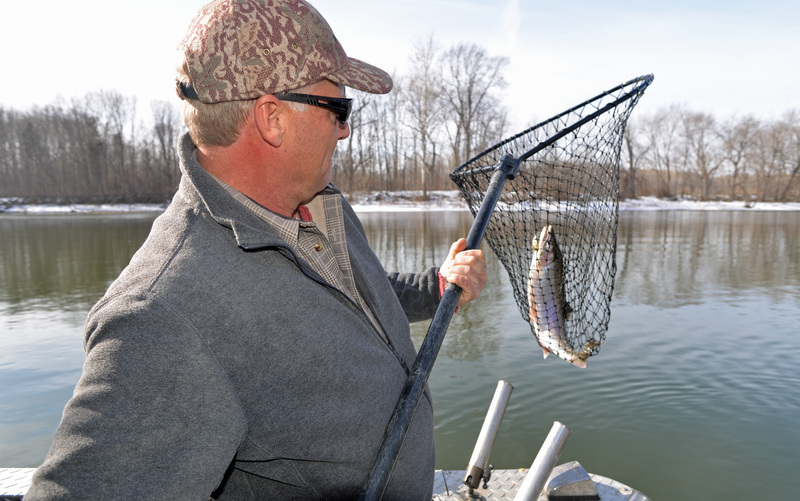 It picks up again when it thaws in spring — or earlier, if anglers can access open water. It would have been a perfect day to stay home and get some other work done, but Clark called, seeing a golden opportunity. The ice cover had broken up, and temperatures were going to be comparatively mild. Our little group launched from River Park in Benton Harbor early in the morning. It was sunny, clear and 17 degrees. Clark, a 29-year veteran charter captain, opted for the lower waters, figuring no one would be there; we’d have first dibs on any fresh-run steelhead. “On an average day, we put four to seven fish in the boat, sometimes more, sometimes less,” Clark assured us. My nicely colored male was number four. And, we would have eight in the cooler by mid-afternoon. “There are fish in the system all winter,” Jay Wesley told me later. He is the Michigan Department of Natural Resources’ acting Lake Michigan basin coordinator. “The issue is whether you can access the river or not, and whether you can sit out there in 17 degrees. Fishing from Clark’s boat isn’t difficult in winter. His Carolina Skiff is covered and has ample room for people to move around inside its heated interior. Once the lines were set, we’d settle into the cabin and tell stories, staying warm until a rod began to shake. Then it was a mad rush for the door. 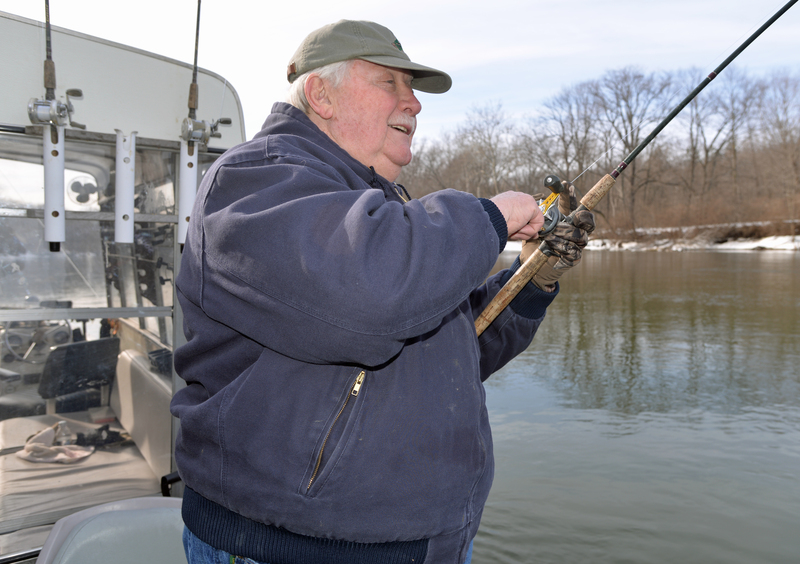 “I like the silver ones; those fresh fish are the best eating,” said Jim Bennett, former president of the Michigan Steelheaders southwest Michigan chapter, and Clark’s friend. He landed the first fish of the day and several others, including one where he reeled forever, taking up slack before he got it under control. It was a nice silver female that swam upstream toward us in quite a hurry. Clark, meanwhile, chatted amiably by phone with another angler, upstream at Berrien Springs, who was having no luck. Clark initially thought to fish at Berrien Springs. Then he called and said he had a change of plans. The lower river was open; a chainsaw took care of the ice at the launch. It proved a good call. The day eventually warmed to 36 degrees, and the fishing action picked up as the day progressed. We finished with eight fish in the boat — a great day by anyone’s account. Clark knows the St Joseph River like the back of his hand. When his invite comes, there’s no staying home in bed. •Scientific name: Oncorhynchus mykiss. Also commonly called rainbow trout. •Identifying characteristics: Two dorsal fins, including an adipose fin, light-colored mouth and gums, small spots on tail. •Average size: Growth varies greatly. Mature fish typically are 16 inches in length and about 9 to 10 pounds, but may reach 36 inches and up to 20 pounds. •Lifespan: Typically 6 to 8 years in the Great Lakes region. •Life cycle: Steelhead mature in three to five years. Most return to their home stream — where they were born or planted — to spawn. Unlike Pacific salmon, steelhead in the Great Lakes do not necessarily die after spawning and are able to spawn more than once. 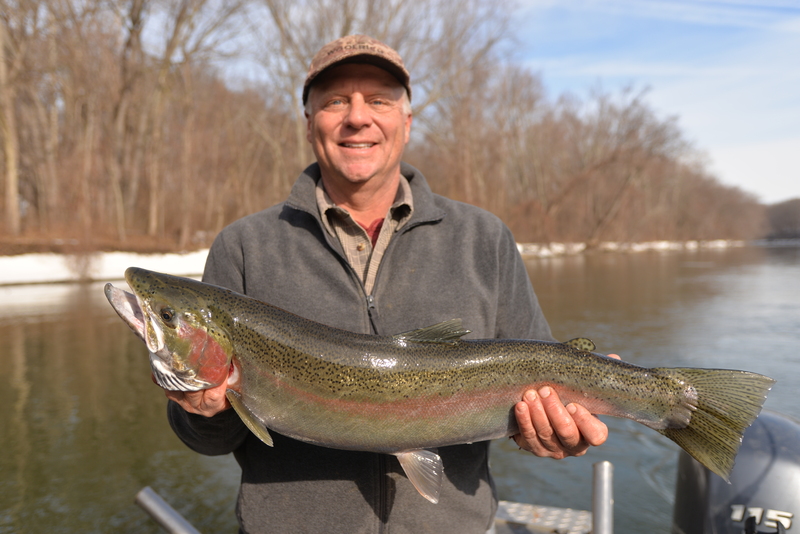 Great Lakes steelhead enter streams between late October and early May. Most spawning occurs in the spring, with the peak of spawning occurring in mid-April. Eggs hatch in four to seven weeks. The young, called parr, typically remain in their home stream for one to three years before migrating to the lake. •Diet: Young steelhead feed on zooplankton and aquatic insects. During the lake-dwelling portion of their life cycle, steelhead eat small fish and insects. Steelhead feed primarily at mid-depths but also will feed on surface insects. •Predators: In the Great Lakes, sea lamprey are the most common predator. Others include larger fish, fish-eating birds such as great blue heron and kingfisher, and mammals such as mink and raccoon. This entry was posted in Uncategorized and tagged DNR, Fish, Fishing, Lake Michigan, Michigan Department of Natural Resources, Sea Hawk Fishing Charters, St. Joseph River (Lake Michigan), Steelhead. Bookmark the permalink. Hitting the Muskegon in two weeks to try and catch one on the swing. Hope it warms up by then. Good luck. I hope you have a reasonably comfortable day. That should be a blast.